A deep collection of meanings for the number fifty two. 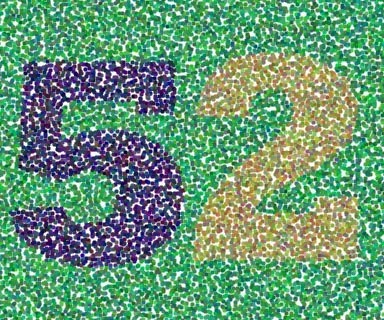 Wu Shí Èr is the Chinese ideograph for 52. Kindness and sympathy, understanding and encouragement, these give: they are better than just presents and gifts: no reason in the world why not. Anyhow, be nice. Remember the golden eternity is yourself. "If someone will simply practice kindness," said Gotama to Subhuti, "he will soon attain highest perfect wisdom." Then he added: "Kindness after all is only a word and it should be done on the spot without thought of kindness." By practicing kindness all over with everyone you will soon come into the holy trance, infinite distinctions of personalities will become what they really mysteriously are, our common and eternal blissstuff, the pureness of everything forever, the great bright essence of mind, even and one thing everywhere the holy eternal milky love, the white light everywhere everything, emptybliss, svaha, shining, ready, and awake, the compassion in the sound of silence, the swarming myriad trillionaire you are. Not only that but this website is a gateway to many other numbers and many interesting topics and information.